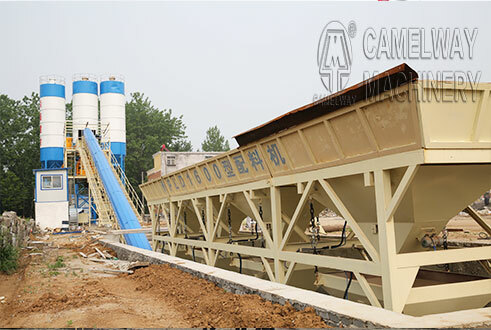 What are properties of concrete in concrete batching station? Different strengths of concrete are used for different purposes. Very low-strength (2000 psi or less) concrete may be used when the concrete must be lightweight.Lightweight concrete is often achieved by adding air, foams, or lightweight aggregates, with the side effect that the strength is reduced. For most routine uses, 3000-psi to 4000-psi concrete is often used. 5000-psi concrete is readily commercially available as a more durable, although more expensive, option. 5000-psi concrete is often used for larger civil projects.Strengths above 5000 psi are often used for specific building elements. For example, the lower floor columns of high-rise concrete buildings may use concrete of 12,000 psi or more, to keep the size of the columns small. Bridges may use long beams of 10,000 psi concrete to lower the number of spans required.Occasionally, other structural needs may require high-strength concrete. If a structure must be very rigid, concrete of very high strength may be specified, even much stronger than is required to bear the service loads. Strengths as high as 19,000 psi have been used commercially for these reasons. What are Models of JZC series Concrete Mixer?